Busy days. Maggie, Matilda, feeds, meds, getting ready for school, trying to keep the house in some semblance of order. The days are flying by. Before the wrong impression of me is made though, let me emphasise just how much of a lazy soul I actually am. I would rather sit. My preference is to lounge. I rue the day that Maggie starts to crawl as my time of sneaking in a quick game of candy crush or checking Facebook whilst she is happy lolling about on her mat will be at an end. But each of her milestones will be met with such delight and wonder, I can’t wait to watch her grow and hear her talk. Because Matilda has not spoken for so long, hearing Maggie’s first word will be a revelation. As will all her firsts. Tilda is doing well! The chest infection has all but disappeared and we are once again seeing smiles. She does this to me. Has episodes where I think that I am losing more of her. And then she rallies. It is quite incredible and inspiring but there is a small sliver of me that knows that there will be a day when she won’t rally. I try not to think of that day and can only rejoice each time she comes back to me. Ask and ye shall receive. Such was the speed and effectiveness of the wonderful Palliative Care team. 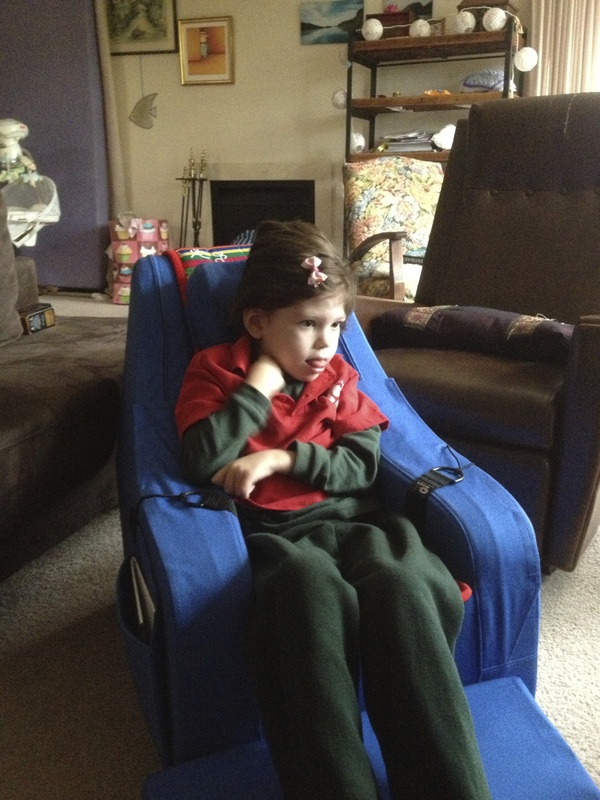 Our new Gravity Chair arrived the very next day after the Palliative Care team visited and Matilda absolutely loves it! She is really comfortable and it is wonderful to have her out in the living room with us for longer periods of time. A huge thanks to the team for being so amazingly responsive! They also have organised some in home care for Tilda during the school holidays, linked us to the Eastern region Palliative Care team who may be able to do some in home music therapy, and arranged another Heartfelt photography session so that we can include Maggie in our family photos. Fabulous! Glenallen School continues to be a wonderful place for Tilda and I am constantly in awe of the love and care that is shown to her and to us as a family from the beautiful teachers. We would be lost without their support and I am grateful for its existence everyday. Tilda came home last week with her hair in a beautiful braid done by her OT – just a small gesture but one that shows how beyond just teaching the staff go for their students. Our gorgeous Maggie will be exactly 6 months on Wednesday. 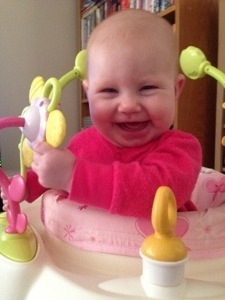 She is a smiley, happy baby who is a constant source of delight. I am grateful to report that her day sleeps are now under control. The night sleep however, is a different tale! We will be tackling it in the upcoming school holidays when Simon has some time off but in the meantime, I nap when she does and this smile makes it very difficult to be cross or sad around her. Yesterday was the 2nd June. 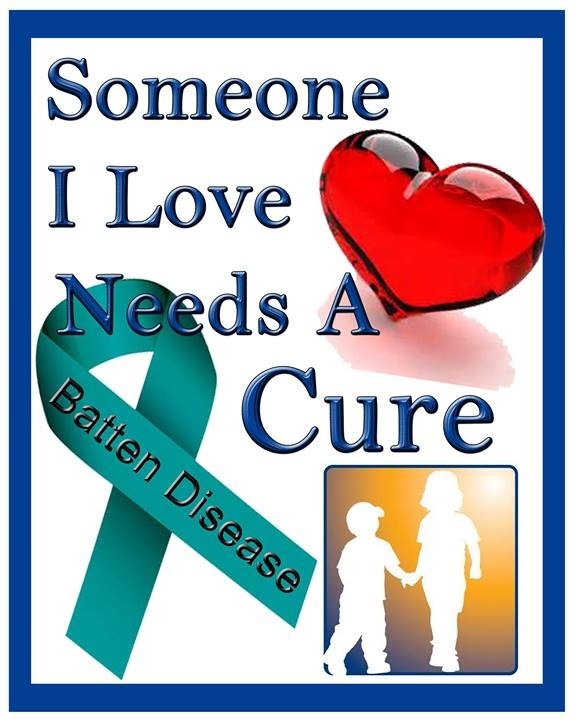 It marked the end of the International Batten Awareness weekend. 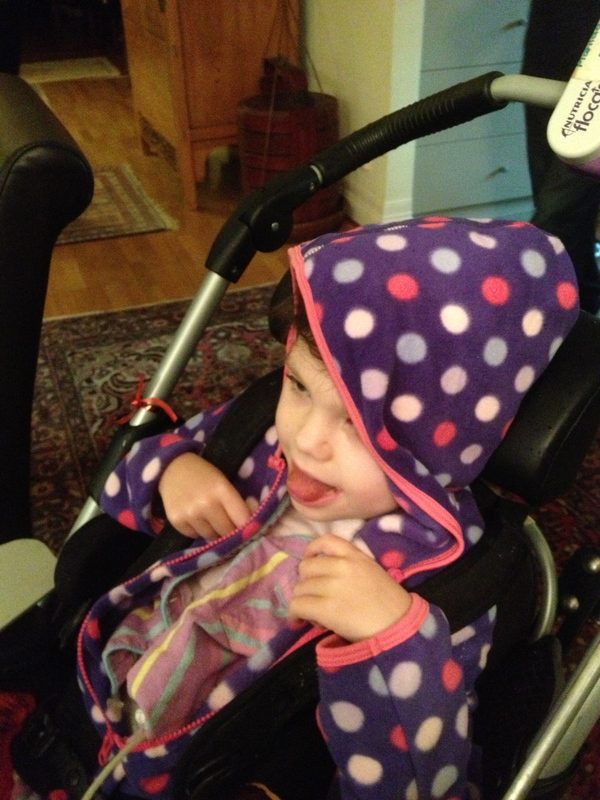 And it marked exactly two years since we learned that Matilda had a terminal illness called Batten Disease. Two years. A lot has changed. Matilda has stopped walking and talking and eating. No more roly poly’s, no more KFC popcorn chicken. Still plenty of Dora though! And we can still see our Tilda shining through. Sometimes. We had a minor setback with her chest infection at the end of last week. 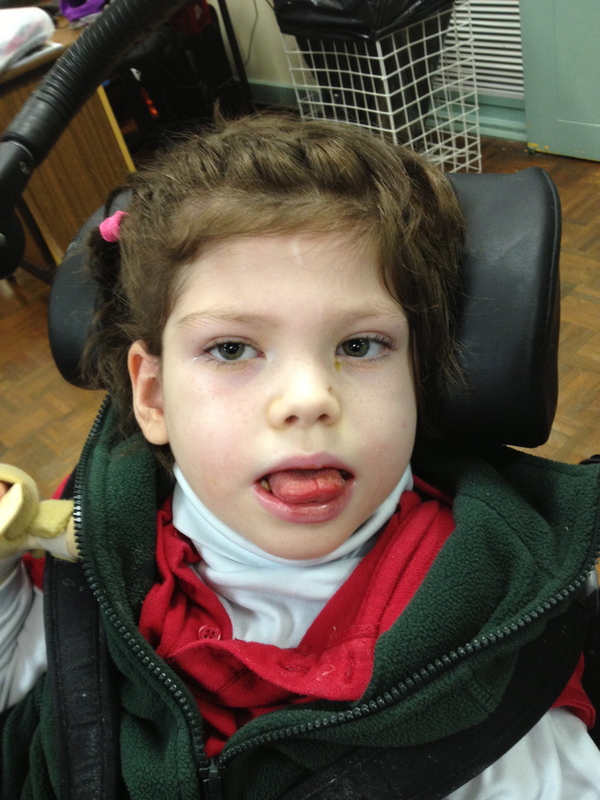 I got a call from school on Friday to come and pick her up as she had a fever, increased seizures and vomiting. We had a script for another round of antibiotics so filled it and have had a a very quiet weekend. Thankfully, the extra round seems to have done the trick and she is looking much better again. She had obviously just not quite knocked it on the head. As always when things go slightly awry , the universe seems to compensate by sending me some beautiful people to make my day. As I type this, the very lovely Ange Raso, dad of a dear friend is busily mowing and pruning and making our garden look absolutely lovely. He came last week as well and it has made such a difference, it is so wonderful to look out the window and see the garden looking so nice – THANK YOU!!!! Thank you also to the beautiful Mish and the lovely Emily for supplying us with some delicious meals and thank you to my wonderful parents for looking after Maggie so I could sleep- truly we have the best friends and family and I feel like I don’t say it enough but we appreciate the support so very much. 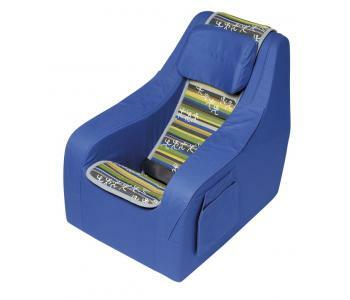 for Tilda to use in the living room. At the moment, there isn’t really anywhere comfortable and supportive for her to to sit apart from her wheelchair and often we feel like we are isolating her in her bedroom because she is so comfortable in her bed. I’d like her out with us as often as possible.